Included in the LATI’s range of specialty products for the past few years, LATIGRAY X-rays opaque compounds now offer a better chance to meet the requirements of the medical device sector. LATIGRAY 82-03 CW/95, in the Natural 0193F3 version, successfully passed the tests for cytotoxicity according to ISO 10993-5. Specifically, extraction tests aimed at evaluating the risk of interference of extractable substances on the vital cell mechanisms were performed. This compound proved absolutely suitable for transient, not permanent contact with living tissues, offering a zero degree of reactivity (therefore classified as not cytotoxic).PA12 based LATIGRAY 82-03 CW/95 contains more than 90 percent by weight of duly selected tungsten powder so as to offer radiation opacity higher than that of lead for the same thickness, without, however, the same toxicity and disposal problems of the latter metal. 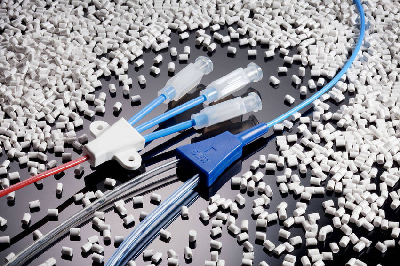 Despite the high filler content, the compound can be easily converted and is best suited to the injection molding of complex parts or items with problematic thicknesses due to the high fluidity of the melt. The thermoplastic matrix also ensures a very low hygroscopicity, as well as a significant chemical inertia and generally an excellent mechanical behavior. The high shielding capacity of the material ensures maximum contrast in all analytical and diagnostic techniques in which, for example, the correct location of the device inside the human organism is fundamental.The natural version of LATIGRAY 82-03 CW/95 is dark gray, but some colored versions are available on request.